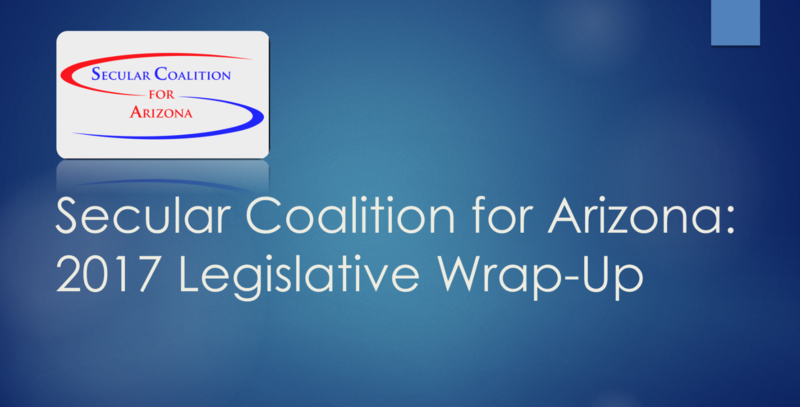 The Secular Coalition for Arizona (Secular AZ) ignited our 2017 legislative work in a charged political environment colored by the general election. We started strong, locking arms in solidarity with over 40 anti-discrimination groups during an Opening Day rally. We began lobbying immediately on January 12th against regressive bills aimed at education, science, and women’s reproductive rights. A September, 2017 study from the Public Religion Research Institute found that those identifying as non-religious are the largest demographic in 20 states, including Arizona. (Here in AZ, "nones" make up 26% of the population.) Of these, six in 10 identify as "secular" while just over 25% identify as "atheist" or agnostic. These numbers illustrate a significant generational shift, and highlight the importance of ensuring that our state's policies are secular... and equitable for all! On April 18th, 2017, State Representative Athena Salman offered a humanist invocation written by a member of her community, the Humanist Society of Greater Phoenix. House leadership then ruled that, despite Salman’s assertion that her higher power is “the goodness in humanity,” Salman broke house rules by not praying to a higher power. Join us on March 21 for Secular Day at the Capitol. First: we're continuing to fight two subjective morality bills that just passed the Senate. The CAP-written S1367 forces doctors to perform life-saving procedures on aborted and preterm births, even when it is clear resuscitation is futile and no matter the gestational age. In a January 10, 2017 press release, the Corporation Commission announced that it will start a new practice: starting meetings with a prayer. Contrary to the statements of Chairman Tom Forese, prayer in any form does not encompass all faiths and beliefs. In fact, prayer before government meetings is a divisive act that only serves to set people apart. On Monday, January 9, 2017, Secular Coalition for Arizona stood in unity with over 40 groups at an anti-hate rally for the opening day of the 53rd Arizona State Legislature. Watch video of our Government Affairs Director, Tory Roberg, as she represented Secular Coalition for Arizona and our constituency. The Secular Coalition for Arizona is dismayed about the results of Tuesday night's election. We're especially concerned about preserving secular public education, equal rights for all, safe and affordable access to women's reproductive health services, and religious freedom for all. While these are concerns nationally, we are especially concerned regarding the new leadership at the Arizona State Senate and Arizona House of Representatives. The Secular Coalition for Arizona (Secular AZ) was founded to advocate for separation of church and state as guaranteed by the US and Arizona Constitutions. We take our role as defenders of freedom, equality, inclusion and knowledge in the state of Arizona very seriously.